Location and distance between suppliers and users plays a large role in industries such as metals and mining. Emerson’s Alan Novak, leader of the alternative energy and metals & mining industry teams, shares his analysis on the global iron ore market. Brazil is adding substantial amounts of iron ore production capacity in the next few years and will soon have the capacity to match Australian output. Will Australia still continue to lead in global markets? The short answer is yes…because of its proximity to China. Let’s take a brief look at why being close to China matters. The primary use for iron ore is in the production of crude steel, which is then formed into beams, reinforcing bar, etc. In terms of total world crude steel production (and consumption) China leads all other markets. 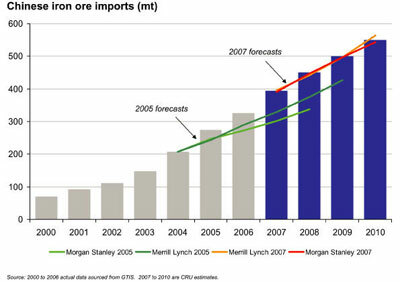 China does have sizable iron ore reserves of its own. It is the world’s largest ore producer by tonnage but faces a number of challenges due to the fragmentation of the domestic iron ore industry and the relatively poor quality of its ore. Even with substantial production, it still ranks as the number one importer of iron ore.
As a recent article in the Financial Times “Rio Tinto and the Pilbara” highlights, this proximity to China provides Australia based iron miners a substantial cost advantage. Rio Tinto, an Australian-based miner and one of the largest iron ore producers in the world, is able to land ore in China for $47/t as compared to a price of $55-$60/t for Brazil-based competitor Anglo American. As long as China’s economy continues to grow Australia’s position as the world leader appears secure. Posted Monday, January 28th, 2013 under Metals, Mining, Minerals.